Lye Peeler-Scalder | Food Processing Equipment Athens, GA | Dixie Canner Co. This piece of equipment is most useful for lye-peeling peaches, pears, potatoes, etc. ; scalding tomatoes; water blanching of products and washing products. Its swing basket in the heated compartment is 18″ x 24″. This compartment is equipped with a steam heating coil and quick-opening drain. 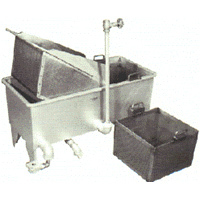 The rinse compartment is 18″ x 18″ and is equipped with a rinse basket as shown. This is a good heavy piece of equipment: 1/2 bu. capacity. If more capacity is needed, use two units side-by-side. All-steel construction resists damage from lye solution. Shipping Wt. 170 lbs., Export 285 lbs., 13 cu. ft. Shipping Wt. 25 lbs., Export 50 lbs., 3 cu. ft.